The splendour of the Rashtrapati Bhavan is multi-dimensional. It is a vast mansion and its architecture is breathtaking. More than these, it has a hallowed existence in the annals of democracy for being the residence of the President of the largest democracy in the world. Few official residential premises of the Head of the State in the world will match the Rashtrapati Bhavan in terms of its size, vastness and its magnificence. The present day Rashtrapati Bhavan was the erstwhile residence of the British Viceroy. Its architect was Edwin Landseer Lutyens. The decision to build a residence in New Delhi for the British Viceroy was taken after it was decided in the Delhi Durbar of 1911 that the capital of India would be shifted from Calcutta to Delhi in the same year. It was constructed to affirm the permanence of British rule in India. This building gave the impression, in the words of a critique, the setting of a perpetual Durbar. The building and its surroundings were supposed to be 'an empire in stone', 'exercising imperial sway' and containing in it, "the abode of a disinterested elite whose rule was imposed from above". That 'empire in stone' and the perpetual Durbar was transformed to be the permanent institution of democracy on 26th January 1950 when Dr. Rajendra Prasad became the first President of India and occupied this building to preserve, protect and defend the Constitution of India. It was from that day that this building was renamed as Rashtrapati Bhavan - the President's House. Apart from Edwin Lutyens, the Chief architect and Chief Engineer Hugh Keeling there were many Indian contractors who were involved in the construction of this building. The sanctioned amount for the building was earmarked at 400,000 pounds. However the long span of seventeen years required for the construction of the building raised its cost to 877,136 pounds (then Rs. 12.8 million). The actual amount incurred in not only the construction of the building but also the Mughal Garden and the staff quarters amounted to Rs. 14 million. Edwin Lutyens was reported to have remarked that the money invested in the construction of the building was smaller in amount as compared to the cost of two warships. It is interesting to note that the building which was scheduled to be completed in four years took seventeen years and on the eighteenth year of its completion India became independent. This vast mansion has got four floors and 340 rooms. With a floor area of 200, 000 square feet it is built by using 700 million bricks and three million cubic feet of stone. Hardly any steel has gone into the construction of the building. 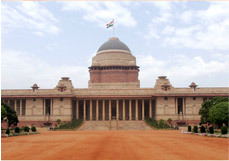 The most prominent and distinguishing aspect of Rashtrapati Bhavan is its dome which is superimposed on its structure. It is visible from a distance and the most eye-catching round roof with a circular base in the heart of Delhi. While Lutyens ostensibly acknowledged the design of the dome to the pantheon of the Rome, it is very strongly believed by informed analysts that the dome was structured in the pattern of the great Stupa at Sanchi. The pre-dominance of Indian architecture in the dome is evident from the fact that it is encircled by railings of Sanchi origin. In fact the whole of Rashtrapati Bhavan embodies in it Indian architectural patterns such as Buddhist railings, chhajjas, chhatris and jaalis. Chhajjas are stone slabs which are fixed below the roof of a building and are designed for the purposes of preventing the sunrays from falling on the windows and protecting the walls from the rains in the monsoon. Chhatris adorn the rooftops of the building and make an exception to the horizontal line through their elevated positions. Jaalis, like chhajjas and chhatris, are also of typical Indian designs which add beauty to the architecture of the Rashtrapati Bhavan. Jaalis are the stone slabs containing lots of perforations which are designed with delicate floral and geometric patterns. Lutyens very carefully used chhajjas, chhatris and jaalis and skillfully harnessed the utility of these designs by deploying them at appropriate places. In few of the jaalis that are installed in the Rashtrapati Bhavan, Lutyens also blended European styles to further enhance their aesthetics and utility. Another redeeming feature of the architecture of the Rashtrapati Bhavan is the use of Indian temple bells in its pillars. It is well known that the temple bells constitute part and parcel of our composite culture, particularly that of Hindu, Buddhist and Jain traditions. Blending these bells with the Hellenic style architecture is a fine example of the fusion of Indian and European designs. Such bells are conspicuous in their absence in the North Block, South Block and in Parliament House. It is interesting to note that the ideas to adopt such bells in the pillars of Rashtrapati Bhavan came from a Jain temple at Moodabidri in Karnataka. When Chakravarty Rajagopalachari assumed office as Governor-General of India and became the occupant of this building he preferred to stay in a few rooms which now comprise the family wing of the President, converting the then Viceroy's apartments into the Guest Wing where the Heads of State of other countries stay during their visit to India. The might and authority of the people of India, which pervades this Republic is represented by the President of the country, whose official residence is the Rashtrapati Bhavan and the architecture of which fascinates as much the ardent architects as the common people across the globe.